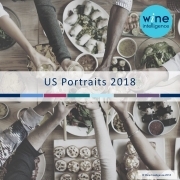 The US is the most populous wine market in the world with 84 million regular wine drinkers. With a wine market as large as this, it is only natural that consumers display different behaviors and attitudes in the wine category. Our latest US Portraits 2018 report identifies six distinct consumer segments in the US market and describes how they differ from each other in terms of profile and behaviors. Learn more about the six identified consumer segments and trends by downloading or purchasing the report today.